Two days ago, Lagos tabloid PM News reported that the wife of the Oyo Governor, Abiola Ajimobi had been arrested by London’s Metropolitan Police for money laundering. The state’s government pushed back immediately – and threatened the publication with a law-suit, while denying the story in its entirety. 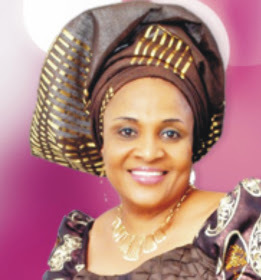 In addition, the first lady, Florence Ajimobi, told journalists that she has “never” had an encouncer with the Met police. returned to Nigeria Wednesday morning from the United Kingdom. She literally walked into a maelstrom, triggered by reports online that she was arrested by the London Metropolitan Police. conference at the Murtala Muhammed Airport to debunk the reports. Just like Mrs. Ajimobi, pmnewsnigeria.com has had to cope with a turbulence of its own as reactions poured forth over its online report that appeared to give a seal of authenticity to earlier reports by some bloggers that Mrs.
Ajimobi was arrested by the Metro Police in the UK. Reports about the purported arrest had gone viral since the weekend. On Tuesday, pmnewsnigeria.com, sought to tear through the web and ascertain the truth by first of all visiting the site of the organization and checking its data base for any mention of “Mrs Ajimobi”. Its search drew blank. It also similarly searched for her name on the website of Her Majesty’s Customs Service. Again, the search turned up nothing. These efforts were reflected in the story. asking the organisation to confirm or deny whether the woman was ever arrested. pmnewsnigeria.com had trodden so many times before, one of which was over the certificate forgery and age claims of the former Speaker of the House of Representatives. After about one hour, pmnewsnigeria.com got a response from the Metropolitan Police, that said at the bottom of its query: “Confirmation: Yes”. Pmnewsnigeria.com wrote its report about the ‘confirmation of the arrest’ based on this response. Was this where the team went wrong? Events thereafter appeared to suggest that the e-mail response was a mere auto-response, its standard, robotized and programmed answer to all enquiries. The team was misled by it and had acted on it innocently. Since then, the Oyo state government, acting on behalf of Mrs Ajimobi has vehemently denied the report and also threatened to sue the website. On our part, we have carried out further checks. And we have found nothing to justify the pmnewsnigeria.com story. Several reporters within the organization have also mailed the Metro Police, separately, asking the same question that pmnewsnigeria.com had asked in an earlier e-mail. They all got the same response, with a note at the bottom of the mail saying: “Confirmation: Yes”. This further confirmed pmnewsnigeria.com belief that it has been a victim of a computer game. In line, with journalistic best practices, management wants to formally disassociate pmnewsnigeria.com with the content of this story and apologise to Mrs Ajimobi and all our readers for this reportorial error. public opprobrium. Its story was not also the product of any political machination. The quest for the truth in the public interest is this website’s duty. It is what the site pursued in the case of Mrs. Ajimobi.